This is a study of the dysfunctional lives of three neighbours who live in the same block (in contemporary London) but are almost complete strangers to one another. It is at once compelling but also considered disturbing. The events are described through the eyes of the three neighbours. 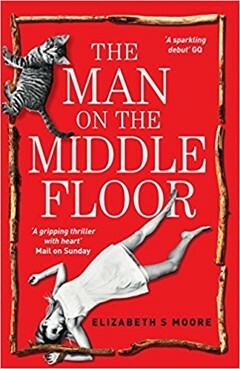 Ms Moore’s insightful piece of writing describes the thoughts and actions of the three main characters and in particular of a person with mental health problems. The line between the sane and the insane is a very difficult subject to approach, and one that could cause a considerable amount of debate. Tam a policeman has a short fuse which has seen him resign from his job, instead of taking a desk job following his return from sick leave. Left with no settlement package after twenty three years’ service, his world is upside down, as his job was the glue that held him together. He's now a practically penniless unemployed man, dependant on alcohol. Can he use the skills his career had provided to find new employment and recover his self-esteem, or is he heading for disaster? Nick is a very troubled person, he appears to have severe mental health issues but is trying to live an independent life. He lives alone but is visited by his mother and his grandfather alternately. His grandfather is less than sympathetic and tells him he needs to get a job and start living his life instead of playing computer games all day. Out for a walk in the park Nick is offended by the sight of a young couple making love and attacks them, killing both. Karen is a mother separated from her children seemingly by her obsessive work focus at the University Hospital. When she does see her three children, she is unable to concentrate on any of their needs for more than a few seconds before returning to thoughts of her very important research work into people with Asperger’s Syndrome. She is also constantly frustrating her ex-husband by failing to meet her childcare responsibilities, so she finds herself being verbally abused by him on her own doorstep (when Tam has to step in). When a vacancy arises in the Pathology Department's morgue Karen sees an opportunity to use Nick in her research. Karen would be able to observe him closely. He is offered the job of assistant in the morgue on a probationary period, and then things begin to happen. Will Tam’s detective’s instinct for a crime identify Nick as a killer in time, or will Nick lose control all together before he is stopped? The interplay between the three neighbours is cleverly knitted together by this debut novelist, in an engaging narrative.